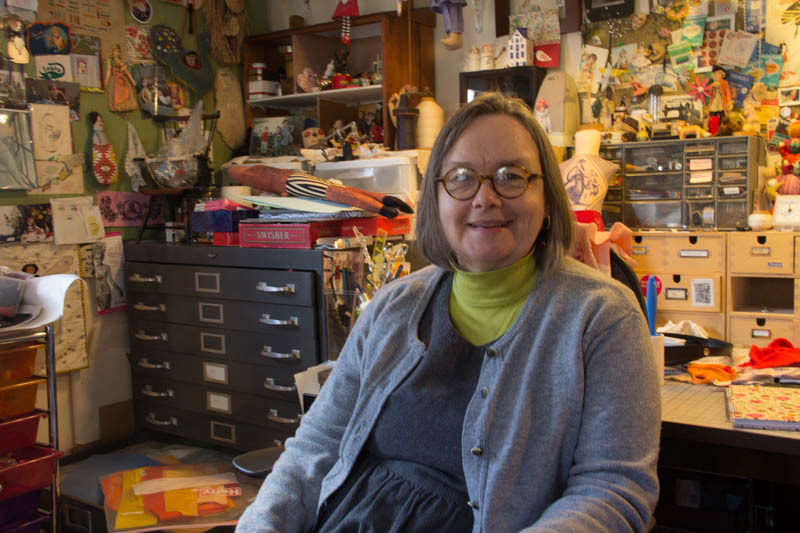 Yesterday, I stopped by doll artist Mimi Kirchner’s for a little visit before heading down Mass. Ave. to pick up my artwork from the Lexington Library. 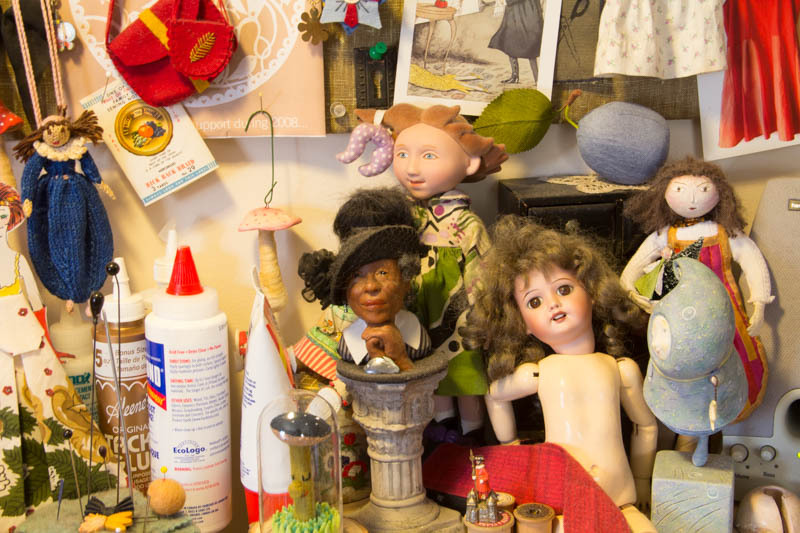 Many of you know Mimi from her signature tattooed dolls and tiny world pin cushions and she was recently on the Felt Wee Folk blog tour. 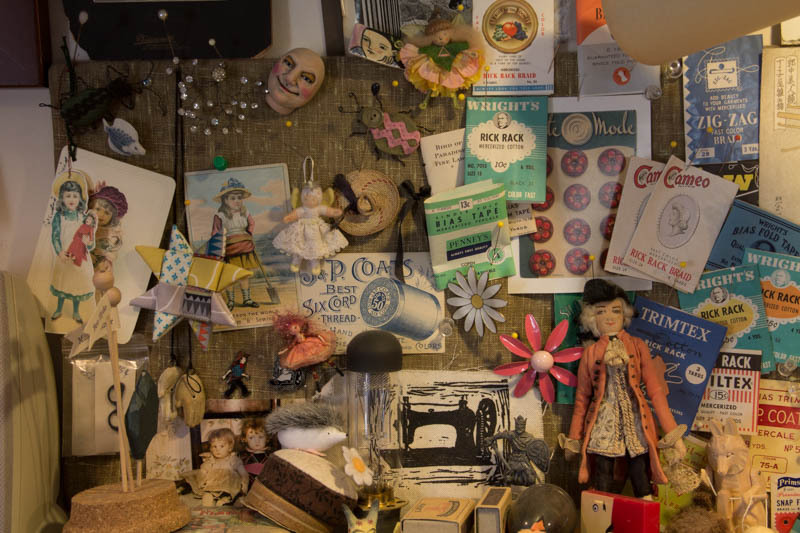 Her studio is so inspiring, with its many wonderful treasures pinned and balanced on every surface. We caught up over lunch, talking about our work and families. We both relish creating in our studios alone, but it’s always nice to connect with a kindred spirit from time to time. This entry was posted in Dolls, Inspiration by Salley Mavor. Bookmark the permalink. THANK you for the glimpse inside Doll Secret Headquarters! You must have executed the secret “needle and thread handshake,” right? I have been following your blog and postings on Facebook and Instagram with much delight. I am a quilter and I love the scale of your work and your incorporation of embroidery and quilting techniques. I have begun using some of your techniques in my own work. Stitching for me is strictly a personal hobby. I don’t sell my work. I have both your books and I was able to purchase most of the children books for my grandchildren. I am enjoying the new book. I’ve made a doll using your instructions and patterns and she was so much fun to make. I attached a pic of her. She doesn’t have a name but I tried to make her in my image.ð if you look at the picture you can see where I tried to create hands like the ones I see on some of your dolls. I was hoping your new book would have included making hands. Is it a trade secret? If so, I understand. You can’t give everything away. I am also curious about how you make the vining you use in so much of your work. I see it in the fairy house you are making and in the piece you call “FaceTime” that I am so anxious to see the final results. Well I better end here. You probably get all kinds of communication from strangers who admire your work. I am one of them. Thanks for writing. I’m glad that you are enjoying the books, etc. Yes, I consider the hands and other more involved techniques that I’ve devised over the years proprietary and part of my personal artistic expression. For me, some methods can be taught and others are just part of the mystery of creating art. You should look at the “Hither and Yon” video to see larger scale covering of wire. https://weefolkstudio.com/hither-and-yon-video/ My blog has lots of posts about different projects, some showing process photos. Just keep searching through! 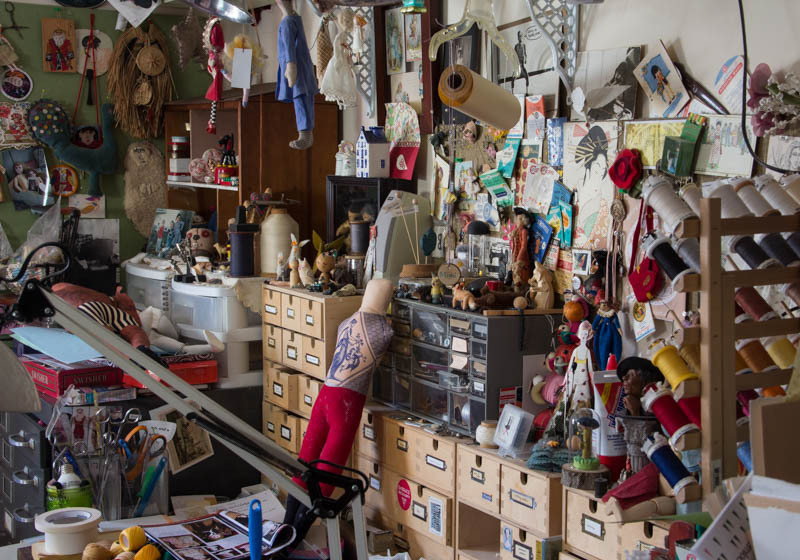 Oh what a pleasure to see inside Mimi’s fabulous studio. What joy to make dolls and toys!! You must have had a lovely and inspiring chat with a soul-mate! !